Jesus replied, ‘Let it be so now; it is proper for us to do this to fulfil all righteousness.’Then John consented. I’m always slightly nervous doing something when I know that there are people around who could do it better. When I played my flute in a church ensemble in Colchester, I was very aware that the other musicians around me were much better than me. The violinist I sat next to had a PhD in music, after all! I feel the same when I’m preaching in church; there will always be people in the congregation who I know could do a far better job than me. Indeed, I feel the same way posting my Biblical reflections onto the internet; there are many, many people out there who could do a much better job of explaining God’s word than I can. You may be one of those people! I imagine that John the Baptist may have felt like this to an extent in the verses above. He had been baptising people in the river Jordan in recognition that they had repented of their sins and determined to live a better life for God. All the while John had been speaking of a more powerful person who would come after him, who would baptise not with water but with the Holy Spirit and fire. Then, who should turn up, but the very person he had been speaking of – his cousin, Jesus, the Son of God, the promised Messiah. I imagine that on seeing Jesus he as only too happy to stand aside and let him take over. John knew that whilst he was only a prophet, Jesus was God himself. John was understandably shocked, therefore, when Jesus told his cousin that the reason he had come to the river was to be baptised – by John! John tried to argue with Jesus, saying, ‘I need to be baptised by you, and do you come to me?’ He was incredulous at Jesus’ request. He knew that Jesus had no need of baptism. 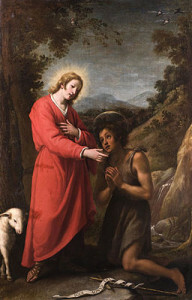 He had baptised with water for repentance. Implicit within his baptism was the idea that people were sinful and needed to repent. Yet Jesus, the Son of God, was free of sin. He had no need to repent, and therefore the symbolism of baptism was unnecessary. Jesus told John that yes, John should baptise him, and that he needed to do so right now. He told John, ‘let it be so now; it is proper for us to do this to fulfil all righteousness’. Jesus knew that if he was to fulfil the role that God had marked out for him, he needed to identify himself fully with his people, the ordinary sinners of the world. How else would he be able to take the sins of the world on his shoulders and die to save humanity if he had not fully identified with us in our sinfulness? What we see in Jesus’ request was his foreknowledge of what was to come. He knew and understood his principle mission, and he knew that this would lead him to death on the cross. In these few verses we get our first glimpse of Jesus as an adult. And we already see him determined to identify himself with ordinary people – the people he had come to save. Jesus was ‘Immanuel’ – God with us. Here, right at the beginning of his ministry, Jesus is keen to identify himself with the rest of humanity, sinners who have turned their backs on God. What a remarkable picture that is, Jesus Christ, the Son of God, passionate to know and understand us in our sin.